George Billis Gallery is pleased to present the gallery’s first solo exhibition of watercolor paintings by Paul Pitsker. The exhibition, What’s Clear Now, features the artist’s recent work and continues through April 2nd. 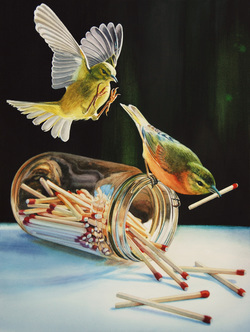 Pitsker writes of his work, “My watercolor paintings combine still life with narrative elements intertwining themes of confinement and looming disaster. They are mock elegies that rely on word play, dark humor, and the intrinsic beauty of their subjects to relieve the tension of unexpected encounters and of contrived existential dramas. My interest is in "delicate subjects," a term meant not just literally but also figuratively, as in, for example, a contemplation of the fragility of life, or of the inevitability of darkness -- ideas we avoid confronting on a more than occasional basis. My goal is to evoke an atmosphere of disquiet and a sense that the answers to our most urgent questions might be hidden in plain sight and yet remain unreachable. Paul Pitsker specializes in watercolor paintings characterized by a near-focus viewpoint, a mock-elegiac tone, and ever-present dark humor. Using handwritten scraps of paper and everyday objects as props, he creates narrative dilemmas and staged existential dramas involving local urban insects and birds and other small creatures, which he renders in transparent watercolor with minute precision, clarity, and sympathy.